The Best of Show-winning 1938 Hispano-Suiza Dubonnet Xenia was developed by André Dubonnet, an inventor, racing driver and World War One fighter pilot. Dubonnet chose an H6 Hispano-Suiza engine for his creation, and commissioned Jean Andreau to design the incredible, streamlined body. Jacques Saoutchik then brought the design to life, featuring curved glass, sliding doors and a panoramic windscreen. Unlike most concours d’elegance events, the Concours of Elegance Best of Show isn’t picked by judges– instead the owners of the cars vote for their favourite. 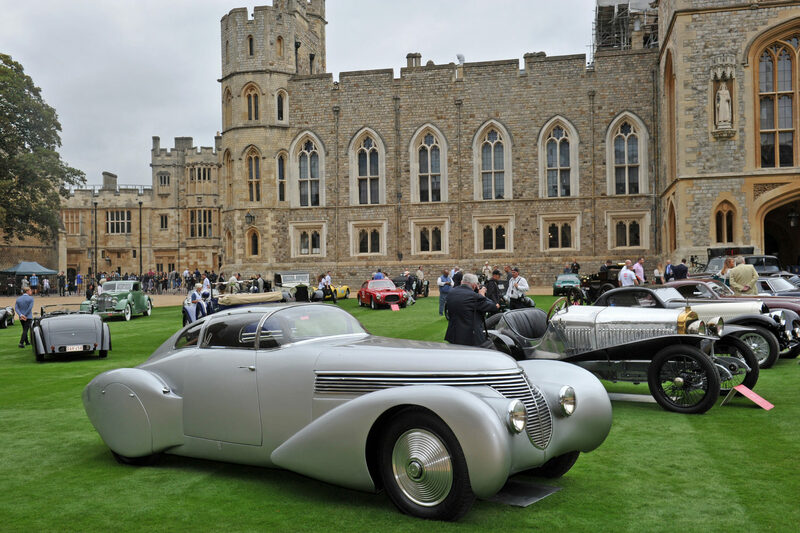 This year the Dubonnet Xenia was the stand-out winner, followed by the Alfa Romeo 8C 2300 Viotti Coupé. The Hispano-Suiza was also a favourite with the public, having won the Classic Driver Public Choice award. With 90 historic Jaguars on display on Jaguar Land Rover Saturday, the competition for the Jaguar Trophy was tough. Led by Jaguar Classic MD, Jonathan Edwards, a panel of judges overwhelmingly decided the car they would most want to take home, was an impeccably restored Jaguar XK120 DHC. Bentley Sunday saw more than a hundred Bentleys lining the Long Walk, and an expert panel of judges, including model David Gandy, with the tough job of picking an overall winner. In the pre-1965 class it was a pristine Bentley 3 Litre that took home the trophy, while in the post-1965 class it was an immaculately maintained Bentley Azure. As ever with the Concours of Elegance, a huge amount of money was raised for the event’s chosen charities; this year The Queen’s Choral Foundation, The Household Cavalry Foundation and Springfield Youth Club Hackney. With this year’s donations of almost £200,000, the Concours of Elegance has now raised more than £1m for charity. The venue for the Concours of Elegance 2017 will be the subject of an announcement in the coming weeks.